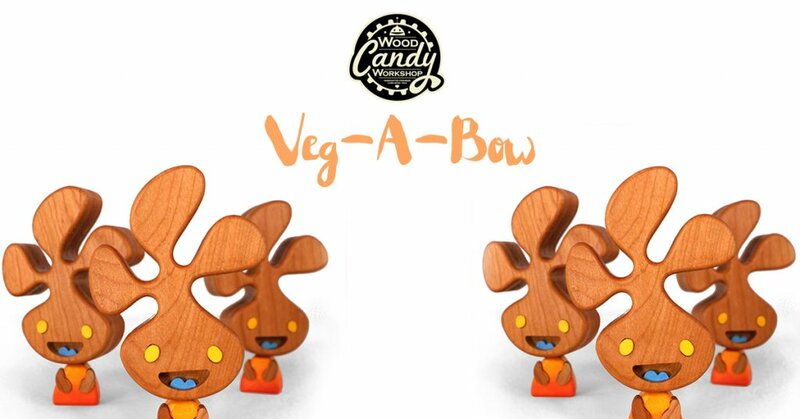 Cameron Tiede of wood candy workshop hopes to enlighten your week this his all-new Veg-A-Bow handmade wooden figure! Today Cameron added a print into the mix. We had the privilege meeting and seeing Wood Candy Workshop at Dcon 2015 and even got to take home Wood Candy Workshop “BIG BAD BELLOW” we can assure you its craftsmanship and quality at its finest. No wonder Wood Candy Workshop’s release don’t last long. •Ships with a 6X8 inch limited edition hand signed and numbered giclee print on 260 g/m2 velvet paper, crystal bag with backer card. •Figure stands about 5 inches high and comes bagged in a muslin sack. •Hand Rubbed in satin oil and topped off with a layer of bees wax. •Designed and handcrafted in Flower Mound Texas.